There’s nothing better than watching fresh snow blanket the ground from the comfort of a warm room with a mug of hot chocolate in hand. Winter in Ohio is a magical time; trees covered in ice sparkle in the sun, holiday festivals come to town, and white snow creates a wonderland. Have the Ohio winter getaway of a lifetime when you stay at the Inn & Spa at Cedar Falls! Access our complimentary Vacation Guide to get the inside scoop on planning your snow-filled trip. 4 Winter Camping in Ohio? How About Winter Glamping? 5 Start Planning Your Ohio Winter Getaway Today! 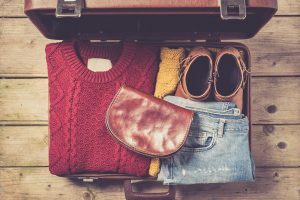 The holidays can be stressful, but don’t let that ruin your Ohio winter getaway! Make sure you take some time to relax. First, try not to think about all the things you have to do for the holiday season. Then, treat yourself to a service at the Spa at Cedar Falls. From massages to mud wraps to facials, you are sure to leave feeling rejuvenated and ready to take on the challenge of getting through winter. We all know at least one person that is impossible to shop for. It seems like they already have it all! So, what do you get them? If you haven’t completed your holiday shopping, you can take advantage of The Gift Shop. Here, you will find unusual gifts and mementos you can’t get anywhere else. Discover local art, candles, holiday items, jams, and more! Or, you can get the best gift of all: a gift certificate to the Inn & Spa at Cedar Falls. From stocking stuffers to excellent gifts, you can find everything you need here. Your Ohio winter getaway will be gorgeous, but it will be chilly! Make sure you pack appropriately. Cozy sweaters are a must, and if you are planning to explore the outdoors, we recommend jackets, proper footwear, hats, and gloves. There’s plenty of time to enjoy the warmth of the Inn & Spa at Cedar Falls, so get outside and explore a little during your stay! Whether you are looking to get outside or prefer the warmth of indoors, there are plenty of Hocking Hills winter activities for you to enjoy! Spend the afternoon at a holiday festival or take a guided hike through the snow. Whatever you choose to do, we promise your Ohio winter getaway will be one you’ll never forget. Hiking in the Hocking Hills doesn’t stop just because of some snow! Seeing the forest blanketed in white and frozen ice formations is breathtaking. Bundle up and explore! The Inn & Spa at Cedar Falls is surrounded on three sides by the Hocking Hills State Park, so you’ll have easy access to this winter wonderland. During your adventure, make sure to pause for a moment. 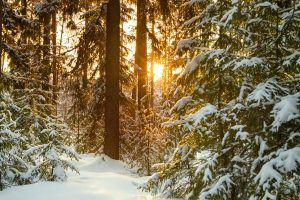 The only sound you’ll hear is the occasional pile of snow falling from the tree branches; it is the most peaceful quiet you have ever experienced. If you’re on an Ohio winter getaway with your sweetheart, enjoy a romantic activity like ice skating! Throw on your skates and head to Lake Logan. Because this is an outdoor lake that freezes due to the weather, always make sure the ice is thick enough to skate on. Hocking Hills State Park is one of the best places to go ice fishing. This activity is incredibly relaxing as you sit on the quiet, calm expanse of ice. Keep in mind that ice fishing holes must be less than 12 inches in diameter and you need to check if the ice is thick enough to be on while fishing. Make sure to access our Hocking Hills State Park Guide for everything you need to know about the area! 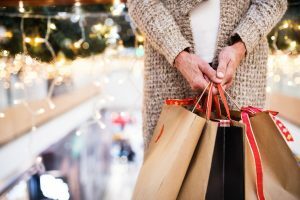 Are you behind on your holiday shopping? Need some retail therapy? You’re in luck; there are plenty of places to browse during your stay at the Inn & Spa at Cedar Falls. Shopping options include antique stores, clothing retailers, gift shops, and more! It’s the perfect retreat from the cold outside. If you need to warm up a bit, take a break from the outdoor Hocking Hills winter activities and head to one of the many breweries near the Inn & Spa at Cedar Falls. Come in from the snow to have a pint or two and get a true taste of our area. Plus, many of these craft breweries have excellent food options you can pair with the beer. Do you ever look outside at the snow and think, “Wow, I really don’t want to go out in this weather today”? You don’t have to go anywhere when you’re on vacation! 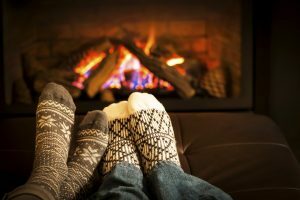 Use this time to relax with your sweetheart, friends, or family at the Inn & Spa at Cedar Falls. Challenge someone to a game of cards, indulge in a couples massage, or venture to our on-site restaurant, Kindred Spirits, for a delicious meal. With everything you could possibly need right on property, it’s the perfect spot to get snowed in. Winter is a magical season in the Hocking Hills, and Ohio winter festivals and events can complete your perfect getaway. From visits with Santa to the Hocking Hills Winter Hike, there’s something for everyone this season! Shop around, sip hot chocolate, and be merry with friends and family. What if we told you that you could support small businesses, win prizes, and get your holiday shopping done all at the same time? You can during the Hocking Hills Holiday Treasure Hunt! All you have to do is collect stamps from six or more of the participating stores. More than 25 stores participate each year, and they’re full of one-of-a-kind gifts that fit perfectly under the Christmas tree! Winners are randomly chosen on December 14, so you will receive the prizes in time for the holidays. Plus, you could win a family getaway to the Hocking Hills! Christmas in Ash Cave is one of the most beloved events of the year. During one evening in December, locals and visitors gather at Ash Cave to celebrate the season. A lantern walk to the cave starts this tradition; then, all ages come together to sit around the campfire, visit Santa, listen to carolers, and warm up with some hot chocolate. 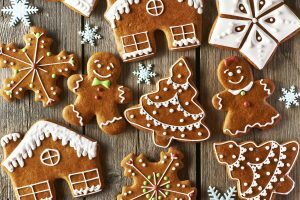 Join us for our fun and informative cookie baking class this winter at the Inn & Spa at Cedar Falls! Our staff carefully selects five different recipes for you to make and eat. It’s the perfect way to get into the holiday spirit! The class includes instruction, recipes, lunch, and a take-home bag of freshly baked cookies. 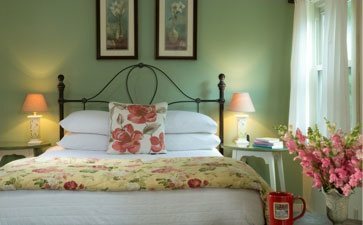 Plus, you’ll get 30% off a night’s stay before or after the class if you mention you are taking this class when you book. The dates change every year, so make sure to check our Calendar of Events for this year’s dates. The Santa Train in Nelsonville has been a holiday tradition for more than 40 years. Each weekend in December, Santa strolls through the heated coaches and visits with each child to hear their gift requests. The trip lasts for about two hours, and the kids get a candy treat from Santa! We recommend buying your tickets in advance since they are known to sell out. In the heart of downtown Logan, Ohio, is the Bowen House, a community center for arts and education that features art exhibits, concerts, events, and workshops. Each Christmas, the house is beautifully decorated with an array of trees and other holiday displays for the Festival of Trees. Each tree is created by a local artist, business, group, or school, so you get incredible insight about our community. It is available to visit Wednesday through Friday from 2:00 p.m. to 5:00 p.m. during the month of December. If you’re looking for a fun and unique way to ring in the new year during your Ohio winter getaway, you will love the New Years Eve Train. Each train car serves soda and pizza or wine and cheese; take your pick! Then, welcome in the new year during the two-hour ride and watch a fireworks display. Are you visiting in January? Gear up for a refreshing six-mile trek through Hocking Hills State Park. The Hocking Hills Winter Hike helps to work off some of that post-holiday indulgence and is a great way to experience the scenery and history of the Hocking Hills! 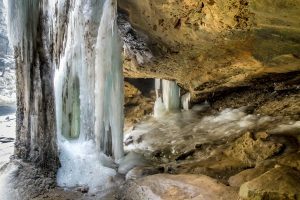 Bundle up and start your journey anytime between 9 and 11 a.m. On your way, you’ll make stops at Old Man’s Cave, Cedar Falls, Ash Cave, and more! The Kiwanis of Logan provide a delicious hot lunch of bean soup, cornbread, and hot chocolate before you complete your excursion. The Hocking Hills Winter Hike is one of our favorite Ohio winter festivals because you get to experience the beauty of our area right next to the Inn & Spa at Cedar Falls. Logan’s Frozen Festival is absolutely breathtaking! It is truly a winter wonderland. Sit on an ice throne, play ice corn hole and skee ball games, and more as more than 30 artists carve gorgeous sculptures out of ice. Grab something to eat at one of the food trucks or indulge in a libation as you listen to the live entertainment! What’s better than warming up from the cold with a big bowl of mac and cheese, tasty chili, or pumpkin bread pudding? 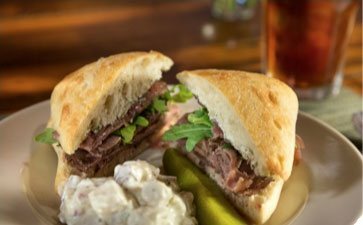 The Hocking Hills Comfort Food Cruise lets locals and visitors try some of the best comfort food in town every weekend from late January to early February. An eclectic mix of restaurants participate each year, so you get to try everything from biscuits and gravy to homemade pizza. If you’re planning a romantic weekend getaway, consider planning it during the annual Sweethearts Hike. 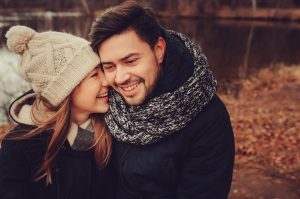 Every year around Valentine’s Day, Hocking Hills State Park holds their annual romantic stroll. Walk hand in hand with your other half to Ash Cave, then enjoy a cozy bonfire and light refreshments. 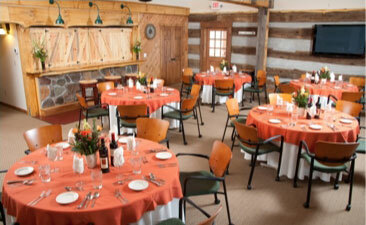 Just check the park’s event page to see what the date is this year and book your stay at the Inn & Spa at Cedar Falls! Winter Camping in Ohio? How About Winter Glamping? In the midst of the hectic holiday season, a relaxing getaway into nature is well deserved! With cold weather and snow, the thought of roughing it in a tent probably sends a shiver down your spine. Instead of winter camping in Ohio, try winter glamping instead. Our unique options keep you cozy and warm while still giving you the camping feel you desire. Our custom-designed yurts combine the very best of refined cabin life and tent camping. It’s the perfect opportunity to enjoy the comforting sounds, sights, and smells of nature without sacrificing the luxuries you’d find at most hotels and resorts. 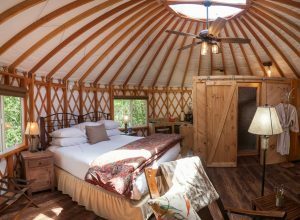 Each 20-foot yurt has a king-size bed or two twin beds, a bathroom with a tiled shower, comfortable reading rockers, a gas log stove, a wood deck, and more. Plus, they are heated for your comfort during the winter season. Our five cabins sit amongst the trees on our 75-acre property. 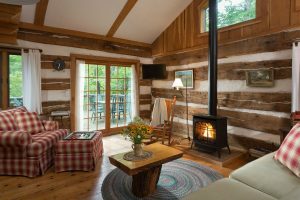 When you indulge in one of our cozy cabins, you’ll get the seclusion and natural beauty you expect from winter camping in Ohio. Each comes with porches and large windows so you can sit back and watch the snow fall. You’ll love getting comfortable by the gas log fire with a mug of tea in your hand as you enjoy the peaceful views outside. Start Planning Your Ohio Winter Getaway Today! Whether you are looking for some more luxurious options for camping in Ohio or are here for an event like the Hocking Hills Winter Hike, the Inn & Spa at Cedar Falls has everything you need for the getaway of a lifetime. From bed and breakfast rooms to spacious cottages and cabins, our property is your home base for the best Hocking Hills winter activities. Get away from the stresses of the holidays with your sweetheart or bring the family to start a new holiday tradition. We even have pet-friendly accommodations, so you don’t have to leave any member of the family behind! We look forward to hosting you this winter at the Inn & Spa at Cedar Falls; don’t forget to get our complimentary Vacation Guide to start planning!